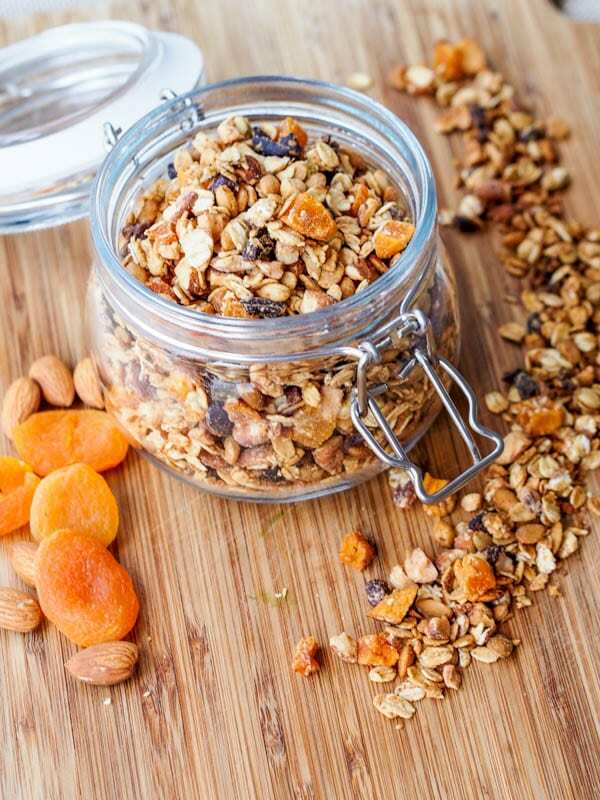 A super crunchy and fruit vegan apricot granola with almonds is the perfect way to start the day. Packed full of flavors and nutrients from pumpkin seeds, cacao nibs, cinnamon, coconut cream, etc. Gluten-Free too and ready in 30 minutes. You already know how much I love home made granola. I make it pretty much every chance I get. I almost eagerly wait for it to run out so that I can finally whip up a new and unique batch. 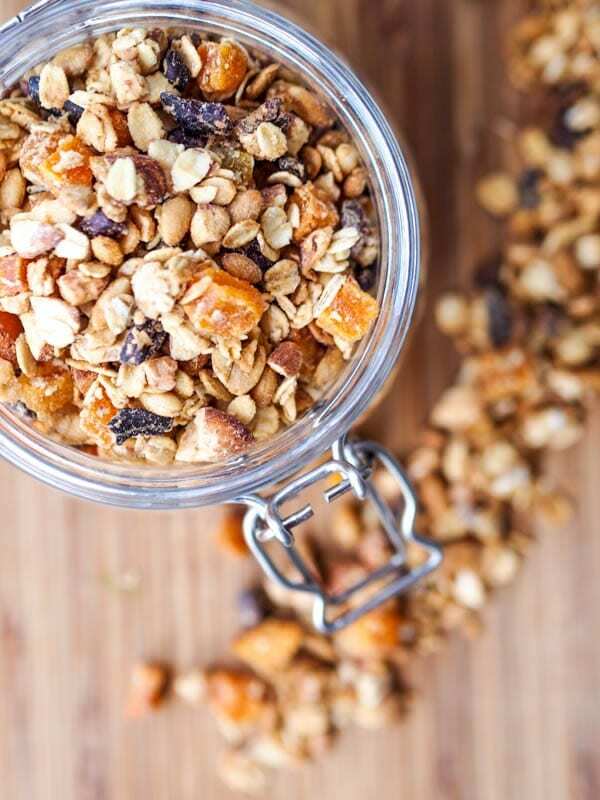 While there are tons of granola options at the grocery store — I mean have you taken a look – there are dozens of different brands and types — but it’s pretty hard to find exactly what I want. You see I’m looking for a search nut/dried fruit/oat ratio — I have when the pre-made granolas limit you in all the goodies that need to be there in much larger quantities. And on another note so many of them are insanely high in sugar content. I mean just off the charts. Completely unnecessary and easily avoidable and controllable when you make your own from scratch. And now that my go to breakfast has become the vegan acai bowl, I have even more reasons to keep experimenting with granola recipes. And it’s just kind of fun to dig through the kitchen drawers and discover new random ingredients that seem to be a perfect granola fit. This time that happened to be cacao nibs and this apricot granola. I tried them on their own once a while ago and was not a fan. Nothing like chocolate I can assure you. Kind of bitter, not rich at all, I was a bit surprised honestly. But in the apricot granola the flavors somehow work. The lightly bitter cacao nibs are balanced out by the sweet dried apricots for just the right balance of flavors. The almonds and pumpkin seeds add a great level of crunch. This time around I used raw whole almonds, for a bit of a change from my usual favorites – sliced almonds, and slivered almonds. All delicious in their own ways. 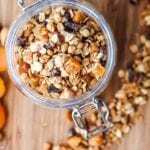 Seriously though, skip the store bought and make your own homemade apricot granola from scratch. The kitchen will smell wonderful and you’ll have a healthy, nutritious, crunchy and delicious snack or breakfast for days. Doesn’t it just look so enticing already? In a large bowl combine oats, almonds, pumpkin seeds, apricots, cacao nibs and cinnamon. Mix until thoroughly combined. In a small bowl combine coconut cream, maple syrup and vanilla extract. Add liquid mixture to the large bowl and mix until smooth. Sprinkle with quinoa flour and mix again. Bake on parchment lined baking sheet in single layer for 15-20 minutes, stirring halfway, until lightly toasted and browned. 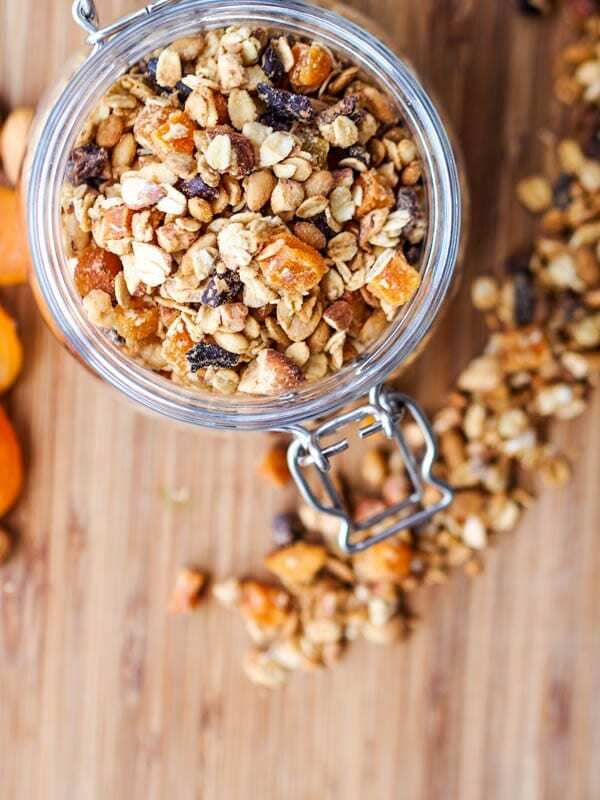 Love the sound of this granola! Is quinoa flour just ground quinoa? Curious because I’m not sure I’ve ever seen it where I’ve shopped. Love these photos! Yep it’s ground quinoa (though the quinoa might be toasted first). I buy the Bob’s Red Mill brand and have been able to find it at my local Wegmans or Whole Foods. Thanks!